Wisconsin Precision Casting Corporation (WPC) is an investment casting manufacturer providing a variety of products and services to its growing customer base. Investment casting is a process that uses sacrificial patterns made of wax or special alloys. It is one of the oldest manufacturing methods used for making jewelery and statues dating back over 5,000 years! The process then involved carving in wax and dipping the carving into slurry of sand and then melting it. With the advent of 3D printing, the interest in the technique is growing in all industrial verticals, providing great benefits with design detail, flexibility, and reduced costs. 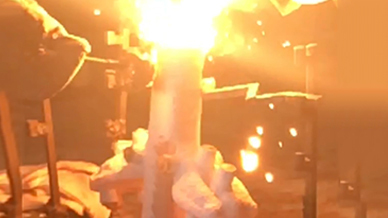 By utilizing the latest technologies and expertise in investment casting WPC provides customers with solutions to save time, money, and stress. From the customer’s initial design to the final product, WPC offers support throughout the entire casting process. Whether it’s engineering support, alloy selection or part size, WPC continues to exceed customer expectations for service, quality, cost and ontime delivery. Trends in casting continue to evolve in order to adapt to industries in which casted parts are used. In order for WPC to meet the demands of these industries and its customers, it is imperative that the latest technologies, machines, and tools are employed. During a recent design study with Altair, the optimization and redesign of a regenerative turbine pump cover was investigated. Regenerative turbine pumps allow fluid to travel through the vanes of the pump multiple times, while centrifugal pumps only allow fluid to travel through the centrifugal impeller once. Regenerative turbine pumps are capable of high pressure and require close tolerances to perform efficiently. 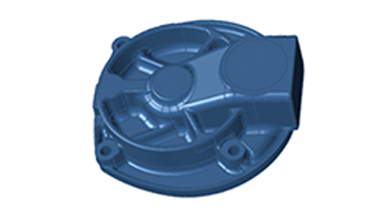 The goals for this redesign were to reduce material usage in the pump’s cover, maintain original strength and performance and improve casting efficiency. WPC provided casting expertise while Altair provided structural analysis expertise using its simulation tools, Altair Inspire and Altair Click2Cast®. 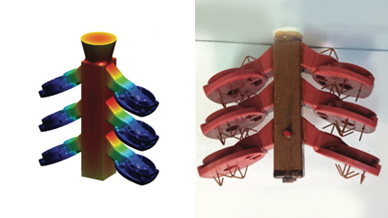 Reducing costs of regenerative turbine pump cover investment castings through structural design optimization and manufacturing process simulation. • Change ingate orientation and size which improved the process efficiency compared to original design. • 8% mass reduction of pump cover while still maintaining original strength and stiffness. • Reduced time in manufacturing/production. • Minimization of casting porosity while optimizing the pump cover structure. Considering the end goal of weight reduction while maintaining the part’s strength and overall performance, the redesign consisted of three phases. In the first phase, WPC inherited the original design from its customer and quickly recognized the need for a more efficient pouring process. WPC reduced the number of ingates and changed the part orientation on the sprue to allow for more parts per pour. These changes would allow WPC to spend less time degating the part while reducing the overall cost per part. This change required a substantial redesign of the cover to facilitate. The next phase in the redesign focused on the optimization of the pump cover structure. 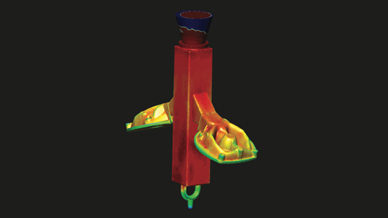 While utilizing Altair Inspire, loads and critical features for casting were identified and a baseline analysis on the proven design was completed. 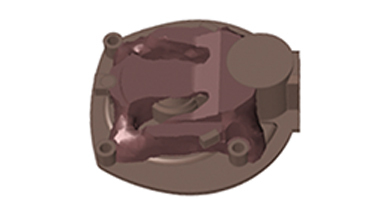 The pump cover was then optimized in Altair Inspire and resulted in an 8% mass reduction and increased strength. During the optimization process, casting metrics were also validated such as porosity and solidification time. “When setting up structural optimization studies it forces the design team to really think about the product holistically. What features are critical and must be maintained or added for both part function and secondary operation? What sets of loads will the design need to withstand? 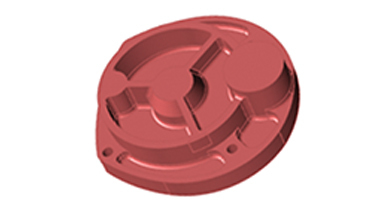 How will the part be oriented in the mold during manufacturing? Because Altair Inspire accounts for these parameters, the process brings all the parties to the table, from design all the way to manufacturing,” explains Dave Roccaforte, solidThinking Senior Application Engineer. During the final phase, Altair Inspire was used to redesign the geometry of the pump cover with PolyNURB wraps over the optimized geometry. 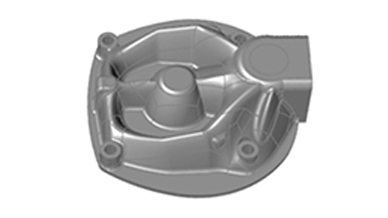 Once redesigned, a casting analysis was conducted in Altair Click2Cast to verify that the cavity and sprue design were suitable for pouring. At this stage, the gates were narrowed to further decrease degating time and a final filling and solidification study was run. After completing the prototype, WPC used the flexibility of printed wax patterns to form the mold. 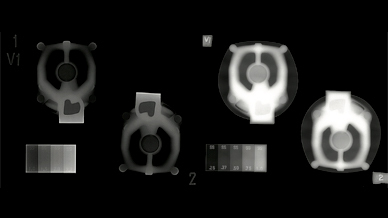 Once the pour was completed, the final parts were x-rayed, studied and contained minimal porosity, which accurately compared to the casting analysis that was completed in Altair Click2Cast. This comprehensive design study allowed WPC to have a better understanding of the optimization and pour process, and provided knowledge on techniques for future designs. 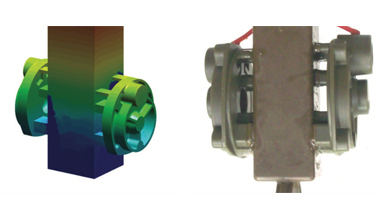 Filling simulation of the regenerative prototype turbine pump cover in Altair Click2Cast. Actual pour of regenerative turbine pump cover at WPC. The primarily family owned corporation, of Wisconsin Precision Casting was founded in 1964 as a precision manufacturer of investment castings. Wisconsin Precision Casting services several industries including: medical equipment, food and dairy equipment, heavy machinery, industrial pumps, metal fabrication, and more. WPC continues to see significant growth over recent years, especially with the 2015 acquisition of Northern Precision Casting. With the acquisition and increased demand for their products and services, WPC has expanded and now operates in two Wisconsin based facilities to better serve their customer base.